Diversity rarely scratches the surface of Paris Fashion Week. But American designer Rick Owens has ruffled some fashion feathers after two seasons of boundary breaking shows. Last season, Owens shocked the fashion world with an avant-garde step-team production, featuring predominately black women stomping down the catwalk. The show was a hard act to follow, but this Autumn/Winter 2014-15, Owens has blurred fashion boundaries again, and caught the attention of All Walks. This season, Owens used models who did not fit the narrow industry standard, and used women of different ages, sizes and ethnicities, many of whom were his friends and employees, to storm the catwalk in his lux-grunge collection. “We were doing something well out of our comfort zone, as mothers, this wasn’t a normal scenario for us, but it feels good,” commented one of the models in an interview with Vogue. The show certainly disrupted fashion norms; not only did Owens use racially diverse models – an issue which has been highly commented on this season – but mature models wore his collection with force and fire, something that rarely happens on the runway. One fashion commentator in a Vogue interview said: “It is compelling to see real women on catwalk. There is imperfection, which is very moving.” The clothing mirrored the toughness the models possessed; with strait jackets and armour-like black, burgundy and grey structured pieces. You weren’t only drawn to the clothes, but the way the women wore them was captivating, which gave the collection a new dimension. Isn’t watching live fashion supposed to be about the interplay of the garment with the model? Owens achieved this, and All Walks hope this will cause a ripple, be it small, in a vast ocean. Could this be the start of diversity on the runway? Or will this simply be seen as a spectacle, and stay a spectacle? Until the day that we are not shocked at seeing diverse women on the runway, All Walks will continue to fight. Designers such as Rick Owens are innovating, which is exactly what fashion is supposed to stand for, isn’t it? Elspeth Merry is a recent University of the Arts London Journalism graduate. 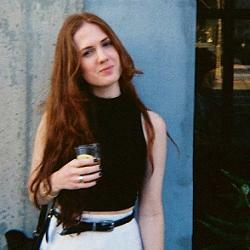 She was Features Editor of her University newspaper Arts London News, and is the Features Assistant at 1883 Magazine. She has also written for the Huffington Post and spent last summer in New York writing for Zink Magazine.